What Does a High-Converting Visual Content Marketing Campaign Look Like? Home blog What Does a High-Converting Visual Content Marketing Campaign Look Like? You’re ready to build a new landing page, but you’re tired of doing the same ol’ thing. Your landing pages look great, but they aren’t performing like you need them to be. Their bounce rate is high, time spent on page is low, and your leads keep dwindling. Whether you’re a marketer or a business owner, you’re reading this blog post because you want to achieve higher conversions. The solution comes in the form of extensive conversion rate optimization (CRO) through the use of visual content. With CRO, your business not only becomes more profitable but your marketing tactics become more scalable, meaning you can use a single marketing asset for multiple purposes. Many who start the process of CRO end up becoming addicted, working until the wee hours of the night trying out the latest CRO strategies (maybe you’re one of them). They can feel it in their gut that right around the corner is a solution to decrease the time it takes to convert a site visitor into a lead and that lead into a customer. You know CRO is an ongoing process — you can always improve your conversion rate — but your latest strategy isn’t working. Why? The key to optimal CRO is basing your tactics on facts, and one fact that remains true is people are visual learners. Research confirms posts with images garner 180 percent more engagement than text-only posts, and people are 85 percent more likely to buy a product after watching a video about it. Why do people like visuals so much? It all ties back into the wiring of our brains. Some research indicates that our brains process images 60,000 faster than they do text. Letters > Words > Punctuation > Sentences > Paragraphs > Subheads process. What does this mean for conversion rate optimization? It means a high-converting visual media marketing campaign should be a central focus within your CRO strategy. As you’re using visual marketing for CRO, keep in mind that every optimization you make impacts your visual identity. First things first, though, let’s make sure you have a good understanding of what a conversion rate is as well as CRO. Your conversion rate is the percentage of people who complete your desired action during a given time period. By measuring the conversion rate on each page, you discover whether the pages are actually persuading visitors to complete your desired action. A high conversion rate means your page copy and design are effective. You, of course, want to measure your sales, but measuring your conversion rates on various goals is essential to quantifying your lead-generation results. CRO is not the same thing as A/B testing, nor does it happen overnight. It requires patience. Just because a product page redesign works well during a one-month A/B test doesn’t mean you need to redesign all product pages. There is a strategy to determining how long to perform an A/B test, and you can check it out here. True conversion rate optimization is a process in which you improve an experience for your audience, and you make it so compelling that it converts them from a site visitor into a customer. You are literally optimizing the experience to ensure they perform your desired action. How do you optimize the experience? You do it by improving every element on the web page. This means you have to measure the effectiveness of each element to determine which ones need improving. It also means you have to do a lot of testing … and waiting. The smallest change can improve your conversion rate, or hurt it. Simply changing the background color of a CTA button can be key to improving a conversion rate. As we said before, because the majority of people are visual learners, visual content marketing is crucial to CRO. In fact, companies that use custom visuals for visual marketing purposes have a seven times higher conversion rate than companies that don’t use custom visuals. But what exactly is visual marketing? When you use a visual to convey information to your audience, this is known as visual marketing. Many marketers combine both regular content marketing with visual marketing to achieve higher conversions. Visual marketing allows brands to share a message through the use of images. All of your visual marketing efforts make up your visual identity. Every time you include a visual on your website or in a social media post, you are adding visual interest to the message, and you give your audience another opportunity to form an opinion about your brand. With visual content marketing, your page all of a sudden becomes more inviting, and the images make it simple for your audience to skim and understand the content; this is crucial to a good user experience and to improve conversion rates. Our homepage does a good job at using visuals to improve the user experience. It’s simple, clean and the CTA is immediately noticeable yet not intrusive. As you scroll down the homepage, we make it simple to find exactly what you’re looking for, and we do this through the use of text enhanced by visuals. And all the while, the CTA follows you. Since visuals are the first elements on the page that your visitors see, it only makes sense to optimize them to achieve a higher conversion rate. To create a high-converting visual marketing campaign that improves your overall conversion rates, you must first decide which types of visuals to use. Infographics are share-worthy, making them an excellent tool for link building. As you secure links from sites with a high-domain authority, you in turn improve your own domain authority. This translates into higher search engine rankings. Higher search rankings result in greater brand awareness, which then transforms into more traffic to your site. And this results in greater opportunities to convert new site visitors into customers, making infographics one of the most powerful visual weapons you can have in your marketing arsenal. Consumers base their purchasing decisions on the benefits they are going to receive. Explainer videos visually highlight the benefits of a product. They allow you to show your audience why they should buy your product versus just telling them to. Explainer videos also come with high view time rates and are perfect for showcasing the benefits of a service or an intangible product. Studies show engagement rates are higher with video material than any other form of content; this stat alone is reason enough to use explainer videos for CRO purposes. Whiteboard animations give you another way to incorporate video into your marketing. Wistia conducted an internal study and discovered pages with video like a whiteboard animation have much lower bounce rates. Your website visitors are likely to spend 2.6x longer on page with a whiteboard animation than they are on pages without video content. Another study reveals you can increase your conversion rate on product pages by 30 percent if you use video on them. Interactive content, like all other forms of visual content marketing, allows you to grow brand awareness, increase customer loyalty, boost revenue, differentiate yourself from the competition, and most importantly, gather qualified leads. 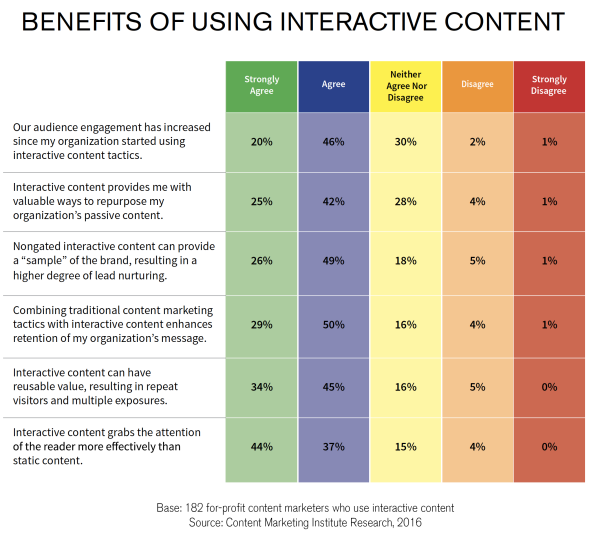 Interactive content engages multiple senses at the same time, increases interest in your message, and provides answers to users in real-time. All of this translates into an optimal user experience, which results in higher conversions. A high-converting visual content marketing campaign is going to reduce bounce rates, extend the length of time on your web pages, improve value per visitor, and most importantly, include a lot of A/B or multivariate testing. When used correctly, visual marketing will improve both your visual identity and your conversion rates. Humans are emotional. Almost every purchasing decision is based on some emotion. 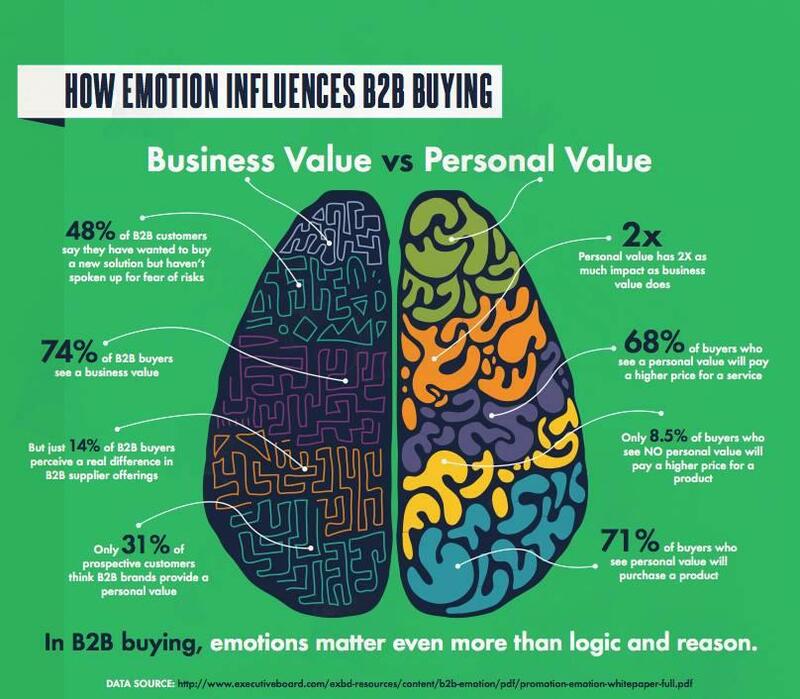 Even B2B purchases are fueled by an emotion. When you’re buying something for a project, you want that project to succeed, so you base your purchasing decision on the success it’s going to bring to not only to the project, but also to your life. A person that lands on your landing page has a problem. It could be a personal problem, a business-related challenge or something else entirely. Whether the visitor wants to achieve success in her career, feel loved, have higher self-esteem, whatever it is, she has come to your site because she’s looking for a way to make her desire come true. You can’t fulfil your visitor’s desire by making your landing page all about you. You have to make it all about her! And since visuals are the number one way to evoke emotion, your CRO strategy should use them to drive your audience toward your desired action. A high-converting visual marketing campaign will include whiteboard animations on 50 percent of your most-visited landing pages. You can measure this 50 percent against the other half to determine how effective the videos are performing. In fact, measuring your visual marketing efforts is crucial to improving your campaign’s effectiveness. Whiteboard animations give you the perfect opportunity to appeal to the desires of site visitors through visuals. Every animation should highlight a problem and a solution. It should also show how that solution will improve the viewer’s life. Using analytics, you can track which pages with video are garnering the most engagement. This visual content marketing metric provides you with a clear understanding of which topics are the most interesting to your audience. You can then use your findings to create more visual content on those topics to further improve your conversion rate. Your high-converting visual marketing campaign will also include a video on your home page. Like we said before, your site visitors are likely to spend 2.6x as long on your home page if it has a video. But what’s the point in getting them to stay on your home page? Well, there is no point unless you’ve carefully crafted the placement of CTAs. A lot of brands make the mistake of using a home page as a virtual storefront with no cash register. Instead, they treat it only as a Welcome Center. Don’t do this! High-converting visual marketing makes use of every page on the site. Your home page should clearly outline what you want your site visitor to do. Whether it’s filling out a contact form, signing up for a newsletter, or making a purchase, make sure the page includes a CTA that is enhanced by effective visual design. Check out the image below. The site does a great job at including a video on the homepage along with a straightforward CTA that instills urgency (more on that in a minute). Keep in mind that you can’t get convert a visitor just with your design — it’s your copy that does the heavy lifting. However, you can use visual cues to move the visitors’ eyes toward the CTA. And as their eyes are making their way to the CTA, your design is compelling them to perform your desired action (your CTA). It’s making them realize if they click on the CTA, they are going to receive something that not only solves a problem but makes their lives easier. An example of an implicit visual cue directing the visitor’s eyes toward a CTA is an image of a person looking straight toward the CTA. An explicit visual cue is going to be even more direct, such as a large arrow pointing straight at the CTA. The easiest way to emphasize your CTA is to use contrasting to your advantage. The color, size, positioning and boldness of the CTA should contrast the rest of the content on the page. Using white space around the CTA is an excellent way to make the CTA more prominent without hindering the design. Always remember, when you hinder the design on a page, you are essentially hindering your visual identity, and this is not something you want to do. Straight-to-the-point, value driven CTAs work best for CRO. Consumers like clear-cut directions, so it’s important to tell them exactly what you want them to do. Even if your home page’s CTA is something along the lines of “Shop Now,” this is straight to the point and is great for achieving higher conversions. Here’s an example of a bad CTA. Are you supposed to enter your email or should you just read the blog? It’s too complicated. And the desired action is not highlighted by any contrasting color. Here’s a look at a good CTA. It’s straightforward, easy to understand, and designed well. Studies show the best-performing ads include a representation of a tangible product. If you’re selling services, though, it’s a bit difficult to show them as a tangible product … or is it? With a bit of creativity, you can easily showcase your services in a tangible product. Let’s say you sell accounting software. Create an image of the software being used on a computer or a smartphone (if you offer mobile accounting software); this makes the product seem more tangible. Studies show pages with real people compared to pages with stock photos perform better than the latter. Not every page has to include an image of a real person, but sprinkling some of your pages with these images is pertinent to building a high-converting visual campaign. You can start out small with images of real people on 10 percent of your pages. Using A/B testing, wait for three months to see how well those pages are performing against those with stock images. Your findings will guide you on whether to include images of real people on more pages. On your landing pages, use colors and illustrations to tell a story. Create an illustration depicting the old way of doing things and put it beside an illustration of the “new way” — your solution. What you’ve done is told an easy-to-follow story of how your new way/solution will make your audience’s lives easier. A high-converting visual marketing campaign always instills a sense of urgency to the audience. Red is known for its ability to initiate urgency because it physically stimulates the body. It’s also associated with excitement, making your audience excited to take advantage of your offer. Blue instills a sense of trust. Build an infographic using a complementary balance of red and blue hues that complement your existing web design and you’ve created a sense of urgency while also encouraging your audience that your brand is trustworthy. Place the infographic on a landing page and watch your conversion rate improve. Visual content marketing is extensive. We could talk about color psychology for months. But high-converting visual marketing is rather simple as long as you use visuals regularly within your content and do so in a way that complements your existing visual identity. One of the best ways to learn how to deploy your own high-converting visual marketing campaign is to look at those who have paved the way before you. Grammarly is well-known for its highly-successful visual marketing campaigns. The company consistently creates engaging visuals with a comical aspect to please the audience. Calling the visual creations “grammarly cards,” Grammarly has attracted a massive following on Pinterest. The Home Depot uses interactive and video content on the social network Vine to increase traffic to its site and improve conversion rates. The company’s profile on Vine is full of dozens of examples of visual assets that show visitors how to perform fun and simple DIY projects. Neil Patel, a content marketing guru, uses visual content marketing to his fullest advantage. He creates visual guides on various content marketing topics and turns them into ebooks. He then takes the ebooks and publishes them as blog posts to create visual masterpieces. These guides are not only highly shareable, but each one of them serves as landing page, which greatly improves his site traffic. Neil also does a great job at using white space to his advantage. Notice how the CTA in the screenshot above is clearly noticeable at the top with a sense of urgency added to it through the use of a warning sign and how the landing page fully complements his visual identity, which is well known for using white and orange. Any and all of the visual marketing strategies you use for CRO purposes are going to impact your visual identity, meaning it’s important to blend your visual identity agenda with your CRO efforts. You can’t simply throw up any infographic or an image of a real person on your website or on social media to improve conversion rates without first considering how this visual asset aligns with your visual identity. A high-converting visual marketing campaign that improves your overall conversion rates is going to include multiple forms of visuals, like explainer videos, infographics, and whiteboard animations. You’ll use these visuals to achieve very specific goals, including those related to link building, social sharing, search engine ranking improvement, and more. Unless you’re a visual content marketing company, you’ll need an agency in your corner that specializes in visual marketing, including marketing outreach, SEO, link building, and design.